Organizers of Bliss on the Hills, Kwahu Republic and Media Excel during the launch of the 3rd edition which took place at Swiss Spirit Hotel formerly Alisa Hotel on Tuesday 4th December, told the press they will fly American-Jamaican artiste Tarrus Riley to Ghana to perform with our top notch stars. 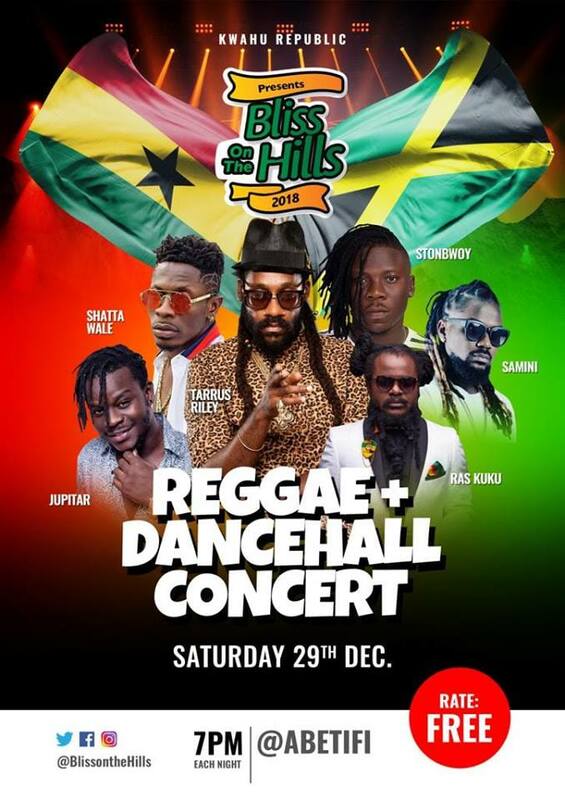 ‘’Bliss On The Hills’’ the annual Christmas program which brings a large number of fun-loving Ghanaians to Kwahu in the Eastern Region of Ghana for a week of music and other entertaining activities will be massive this year. These events are organised in a way that enables the residents and visitors to enjoy every bit of the Kwahu Mountains with its serene, cool, soothing and world acclaimed baby making weather enhanced by the undulating ever-green landscape, while experiencing the warm welcoming nature and intricate festive culture of the people of Kwahu. The program will open with a gospel Night show on 25th December where shakers and movers in the gospel fraternity will mount the stage to release the anointing of God on the gathering. The likes of : SP Kofi Sarpong, Ceccy Twum, Gifty Osei, Elder Francis Adjei, Yaw Sarpong, Francis Amo, Obaapa Christie and others. The second day, 26th December, lovers of boxing will have an unforgettable experience of a lifetime. There will be six exciting boxing matches featuring the likes of Bukom Banku,Ayitey Powers and other renowned boxers. On the third day, December 27, will be the afro pop night, to replace what used to be called Hiplife night in the past editions. The atmosphere would be charged when Obrafour, Wendy Shay, Kidi, VVIP, Dada Hafco, and Paa Kwasi (Dobble) and many others, take their turn to thrill the crowd. December 28, will be an open day for guests to go sightseeing at the various Kwahu tourist sites. The beautiful steep cliff of the Kwahu Mountain is a sight to behold as one enters the towns. Lovers of reggae and dancehall will have a field day on December 29, with American reggae singer of Jamaican descent, Tarrus Riley popularly known for songs like “she’s royal and just the way you are girl”, as the special guest of the night. For the excitement on the night to be complete, Samini, Shatta Wale, Stonebwoy, Ras kuku and Jupitar will hold the gathering spellbound. The bliss on the hills programme is an initiative of Bryan Acheampong, MP for Kwahu Abetifi, who believes that these events will not only create avenues of economic empowerment for the people of Kwahu but will also establish a tourist platform for Ghanaians to exhibit their creative art skills, culture and lifestyle in various entertaining ways. “Bliss on the hills” event which is gradually becoming an annual music festival is organised by “ the Kwahu republic which was founded by Bryan Acheampong to pitch Kwahu as the centre of happiness in the world with support from Media Excel, Event factory and Azumah Nelson boxing promotions.